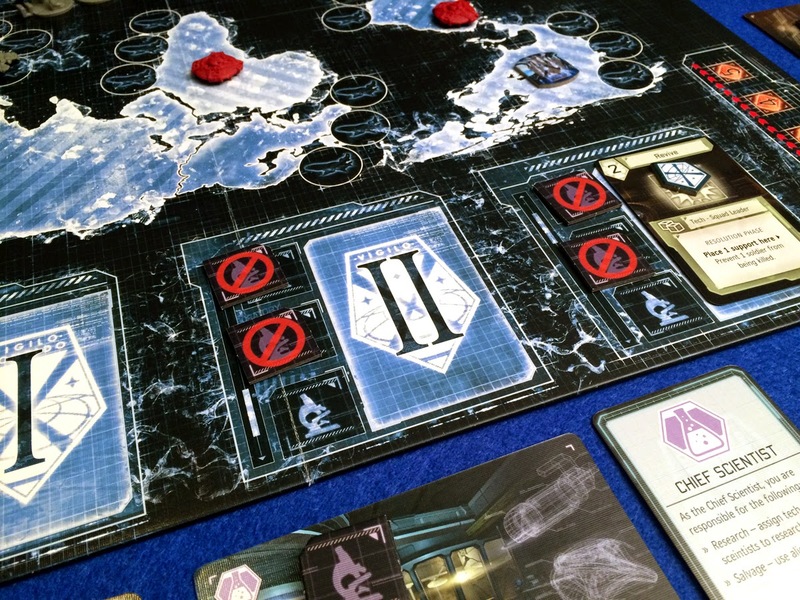 The weird thing about XCOM The Board Game is there is no rule book. It’s one of those things you expect to find with a board game and when you first open XCOM you’ll be hunting for one and thinking Fantasy Flight Games have forgotten to put your rulebook in the box. However, there is no rulebook. 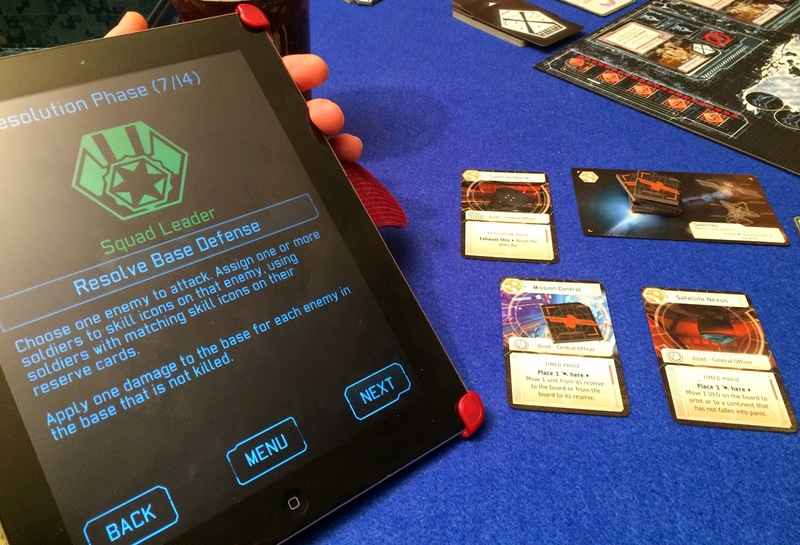 XCOM is designed to be played with an app on your tablet or laptop. This isn’t some companion piece of software that helps the game run more smoothly, no, the XCOM app is integral to the game, and without the app this game just wouldn’t be XCOM. XCOM The Board Game is based on the highly successful video game released in 2012, which itself was a remake of a whole host of games from the past that, for me started with UFO: Enemy Unknown (the game had a different name depending on which side of the Atlantic you sat). In XCOM, an alien threat is invading Earth, but rather than attempt a frontal assault they are infiltrating and subduing our world. XCOM is the name of the organisation responsible for stopping the alien menace and must protect Earth while also researching the alien biology and technology to counter the threat. I should probably point out that I absolutely love the 2012 XCOM video game and have dipped in and out of the many of the games in the series’ history. In fact I love the game some much I even called it out as a perfect video game to convert into a board game. 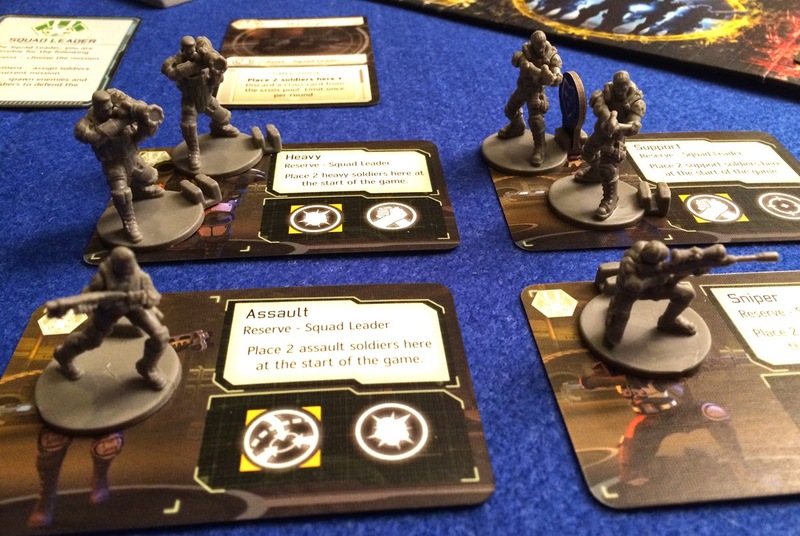 XCOM The Board Game doesn’t focus on the tactical combat that makes up so much of your time in the video game, if you’re after this kind of experience then you probably want to have a look at a miniatures game such as Infinity (and I highly recommend Operation Icestorm as your starting point). 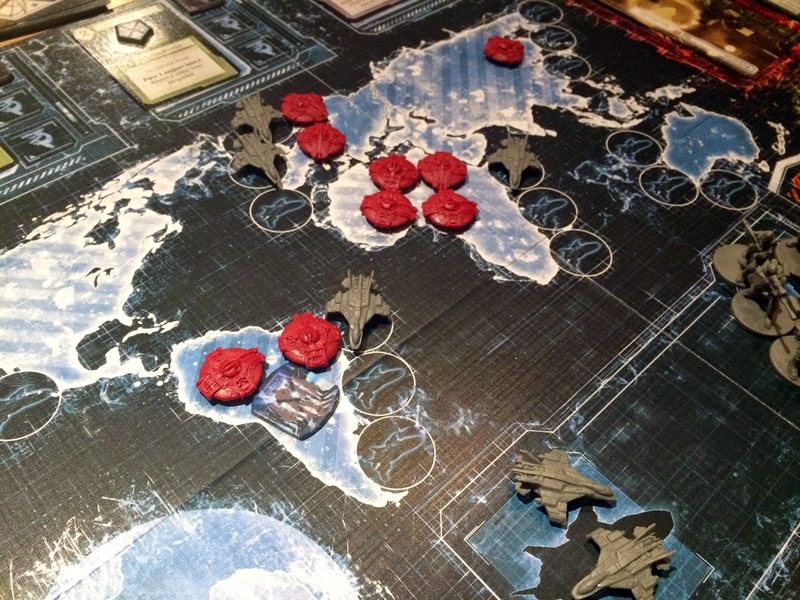 Instead the board game looks at the macro level of XCOM and assigns each player a different role and responsibilities. One player looks after the engineering department, assigning resources to research into new equipment that can help the mission, another player takes control of XCOM’s finances and interceptors, and their job is to shoot down invading UFO’s while balancing the books and making sure XCOM doesn’t overspend. The Squad Leader controls the troops on the ground; not only protecting the XCOM base from attack but also send soldiers onto missions that will eventually win you the game. Last of all is the one person in control of the app, their job is mainly to relay information to other players and instruct when each player gets to take an action, they also control defensive satellites that can help XCOM in a number of ways. So far, so cooperative. Each player has a separate set of skills and something they need to do but it’s the app that takes this game from a simple cooperative game to a stress inducing panic attack and frantic shouting across the table. The app splits the times where players can make decisions into tiny little pieces and then forces a time limit upon that decision. You only have a few seconds to decide what to research, a brief moment to select your squad for the mission and never enough time to choose which of the utterly evil Crisis Cards you wish to play. Just like Damage Report, that we reviewed last year, the addition of a timed element raises the cooperative game from an amenable bumble to a cardiac arrest inducing sprint. Players have so little time to assess their own situation and options that you just have to assume that the other players are doing the right thing. If you take your eyes off your own station to see what everyone else is doing you can often make a grievous error, while at the same time you have to be aware of how your actions will affect how the other stations’ play. This leads to a lot of proclaiming the action you’re taking hoping that everyone else is paying enough attention so you don’t fully bugger it up. It means that XCOM has to be played as a team, and to defeat the game you’re going to have to operate like a well oiled machine. It may take a few games to get the swing of it, but there’s nothing more gratifying than witnessing a turn play out smoothly, that is until we get to the end phase. Once players have finished the timed section, all actions have to be resolved. This is where we find out if XCOM is over budget, where we hopefully harvest the fruits of our engineering label and where we blow aliens into smithereens. Resolving the budget is the most deterministic part of this phase, you’ve either got enough money or you don’t. If you do have any money to spare, well done you can now recruit more soldiers and interceptor pilots, but if you’ve overspent the nations who fund your little enterprise are unhappy and believe you can’t be trusted. Panic raises, funds get withdrawn; all in all you’ve buggered it up! Whether it’s completing research or shooting down UFOs, these are resolved by rolling some XCOM dice (effectively a success on a 5 or 6) and a threat dice. The more resources you have committed to the task the more XCOM dice you roll, however, you also roll an eight sided threat dice. If the result of the threat dice is ever below the current threat level the task is failed and soldiers die, interceptors get shot down and engineers get tired and need a nap. A player can keep rolling until they’ve either completed their task or been eliminated, the trouble is with every roll of the die the threat level increases. Although the time limit may have been removed, this little push your luck element means that he conflict and tension have not and there’s still a risk that your soldiers are going to die, that Europe is going to be invaded, or that the aliens will destroy your base. 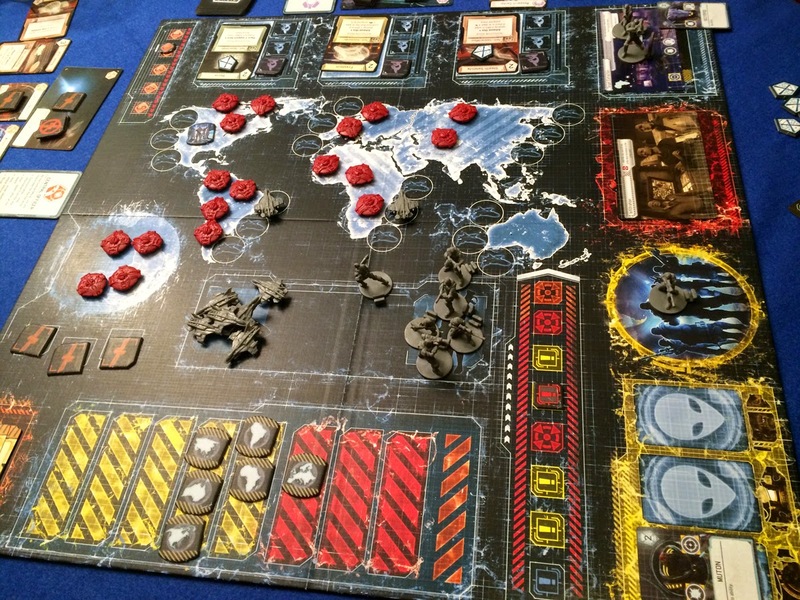 XCOM The Board Game is everything I wanted it to be, it takes a macro view of the XCOM story and creates a tense atmosphere that’s just as threatening as its video game counterpart. The asynchronous rolls are extremely well designed and balanced, no matter which role you take you always feel that everyone else has got it easier than you and that game is just full of neat little design features that make the game a breeze to play and encourage teamwork. If I have a concern with XCOM it’s that I have seen everything the game has to offer, even after a few games. While it is true that there are multiple missions, technology and crisis cards available, after a handful games you’re going to have seen most, if not all, of these cards. XCOM is a game that doesn’t make drastic changes between games. I am not saying this is a bad thing, merely something for you to be aware of. 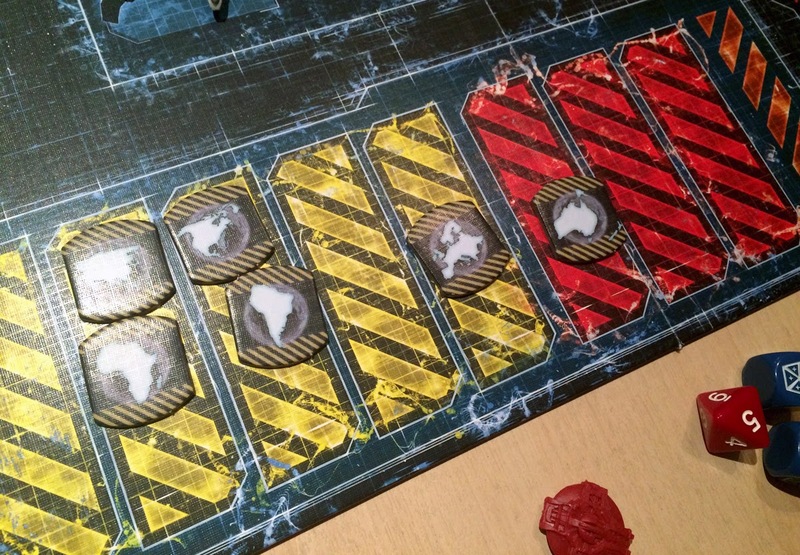 Pandemic is an absolutely fantastic cooperative game and although the details may change between games, the way it plays out is largely the same. XCOM is very similar in this regard; in fact XCOM and Pandemic actually make an interesting comparison, and are more similar than they might first appear. XCOM feels like adding a stopwatch to Pandemic, which both increases the pressure ten-fold and gets rid of the big old bossy boots problem. And that is one of XCOM’s greatest strengths. By adding a time limit to each action and forcing players to act quickly when it’s their turn, the common problem with cooperative games is neatly avoided. Although there is chance to discuss your options, players are often so engrossed in what they need to do that the chances of Mr or Mrs Big Bossy Boots (sometimes referred to as the alpha gamer or quarterback, but I don’t really understand that term as rugby doesn’t have quarterbacks) to take control of the game and tell everyone how to win is massively reduced. XCOM The Board Game’s balance of threat and reward are sublime, not since Pandemic have I seen a cooperative game where defeated players are so keen to set the game up and try again, or victorious players jumping at the chance to up the difficulty and try again. I believe that the app adds something essential to this game and without it the game would be too easy and would lose most of what makes it so good. XCOM is a game full of emotions; panic and frustration at the short time limits, dread and tension at the resolution of events and genuine elation or despair when you win or lose the game. Excellent review. Thank you. I dismissed this game as gimmicky, but after your review, I think I may take a look at it. It definitely doesn't feel like a gimmick, in fact it feels like everything has been carefully designed to fit together smoothly.